Portland Thorns FC acquired the No. 2 overall pick in the 2016 NWSL College Draft from the Boston Breakers, it was announced Tuesday. 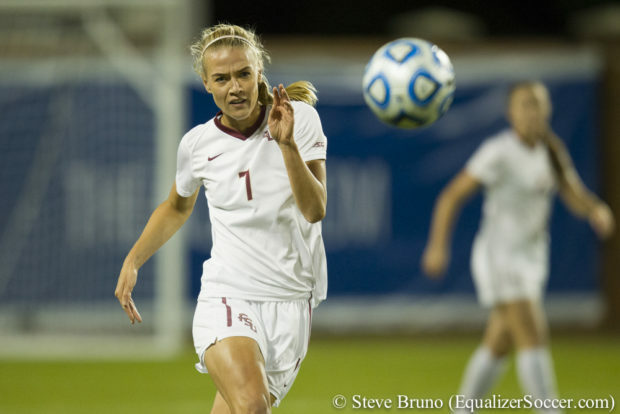 The Thorns also acquired Icelandic international and former Florida State standout Dagny Brynjarsdottir from Boston in a sign-and-trade deal. In exchange for the No. 2 overall pick and a second-round (No. 20 overall) pick, Portland sent midfielders Sinead Farrelly and McCall Zerboni to Boston. Additionally, the Thorns sent that same second-round pick (No. 20 overall) and a fourth-round pick (No. 35 overall) to the Breakers for the rights to Brynjarsdottir, who in January chose not to enter the NWSL draft, instead signing with Bayern Munich. Brynjarsdottir was blocked from signing with the Western New York Flash earlier this year due to NWSL rules. With the the Alex Morgan-to-Orlando trade expected to be finalized Monday, the Thorns will have the first two picks in January’s draft. Brynjarsdottir, 24, scored two goals in nine games with Bayern before leaving the club. She most recently competed with UMF Selfoss during the 2015 campaign, scoring 10 goals in 17 games. Before that, she was a finalist for the MAC Hermann Trophy, given yearly to college soccer’s top player. In international competition, Brynjarsdottir has earned 57 caps and scored 13 goals for the Iceland Women’s National Team. She participated in the qualification tournament for the 2015 FIFA Women’s World Cup and competed at UEFA Women’s EURO 2013 in Sweden, scoring the game-winning goal in a 1-0 victory over the Netherlands to lead Iceland to the quarterfinals for the first time in history. Farrelly and Zerboni will be part of the rebuild for Boston following a last-place finish. Last month, ex-Liverpool manager Matt Beard took over the team following the Breakers’ parting with Tom Durkin. Farrelly, 25, appeared in 36 matches (35 starts) for Portland in two seasons with the Thorns, tallying two goals and two assists. Zerboni, 28, scored twice in 18 games last year with Portland after coming over from the Flash. Earlier Monday, Thorns owner Merritt Paulson released a statement saying the club has “targeted several world class players” and asked for patience from fans as trades are announced.